Since Rome is built on 7 hills, there are a lot of spots where you can admire an unforgettable sunset. One of my favorites is the Quirinale hill. I usually pass by that place racing on my bike, trying to be on time for some appointment in the city center. But, even if I’m late, when I cross the Quirinale Building, my eyes are captured by that amazing view and I have to stop to admire the landscape. I have a big collection of pictures taken from that spot but the best are those at sunset. The sun goes down just in front of you and close to San Peter’s church. 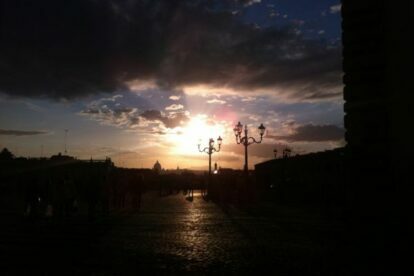 You will see the skyline of Rome perfectly drawn by the sun. And if there are some clouds in the sky it’s even better. This is an amazing spot for a wonderful sunset right in the city center and for a wonderful “postcard photo” to show to your friends.